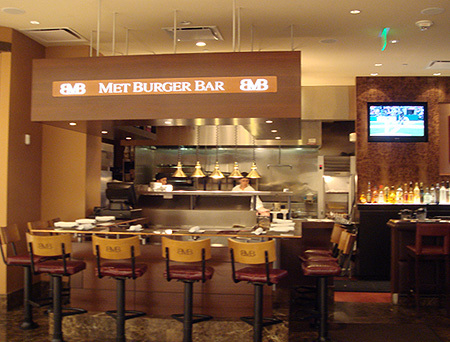 Last week we were in the mood for a burger and heard that the Met Bar at the Natick Collection has great burgers. I usually stay away from the mall but it was a weeknight and I had to get special colored m&m’s from the “Sweet Factory” for my sister’s baby shower so we ended up here. 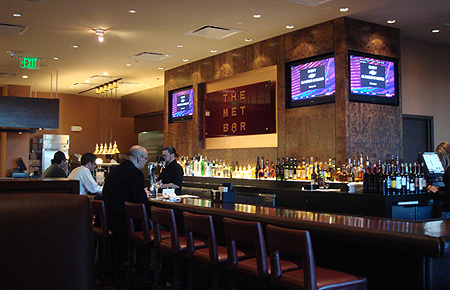 The Met has a dining room, booths by the bar, a regular bar and a “burger bar” where you can watch your burger cooked in the open grill area. We started off with a couple of drinks. Ethan got some sort of blood orange or pomegranate martini and I just got a Lime Rickey but it was excellent, made with fresh crushed raspberries. 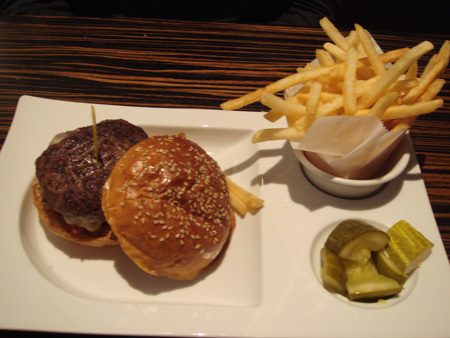 The burgers were really good and they came with fries that were okay, not bad but not amazing and a nice little side of pickles. The service was okay. I know I read from some people’s reviews that the service is terrible but it was okay, maybe a little slow. I did get the feeling our waiter was a little shticky, trying to up-sell dessert at the end asking how we can’t have room for dessert when we just ate those “little” burgers (I don’t think they’re little, and they’re very filling) but it’s not hard to just say no. So it wasn’t too bad since that was the worst of it. I’m guessing for a few reasons we probably just won’t find ourselves here again but I would recommend it if anyone was curious about it like we were. I’m actually surprised to read that you’ve heard elsewhere that the service was terrible – and you felt it was only “okay”. My wife and I tried this place out last month for a “date” and thought the service was fantastic. Our main waiter was very polite, very quick, and not at all pushy (although he didn’t have to be – we did drinks, appettizer, burgers, then dessert without being prompted, which may have helped). Throughout the meal, we had other silent staff types popping in to take empty glasses and plates, top off water, etc. The real crowning moment was when my wife accidently (though amusingly) spilled ketchup on the table and floor while trying to shake the bottle. She was mortified. Within seconds – literally – we had one waiter at the table with a wet cloth cleaning the surface, another waiter on his hands and knees cleaning the floor, and a third checking that she wasn’t hit by the projectile ketchup while ensuring her that there was no need to be upset about it. What stood out was how quickly and calmly all this happened. What could’ve turned into a scene was handled so well that it was like it never happened. When we finished, our remaining food was packed neatly and quickly, our waiter stood at the booth while we climbed out and wished us a good night, and the two hosts at the door were warm as well. We were there between 6 and 7:30 PM on a Wednesday, for reference. Excellent experience and, while we won’t go regularly since it’s not the best place to take our 3 year old, the two of us will definitely return in the future. I enjoyed the Metro Bar and Grill. I had a great goat cheese salad with some sirloin added to it! It was fabulous. 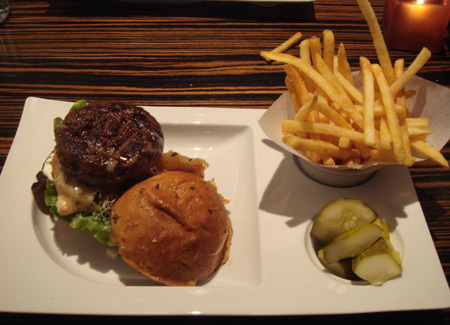 We sat at the burger bar and the service was fantastic. Mine was called The Mexico City and it was pretty darn good. The burger is topped with jack cheese, jalapenos, guacamole, cilantro and salsa. I asked for no guacamole, and they pleasantly obliged. 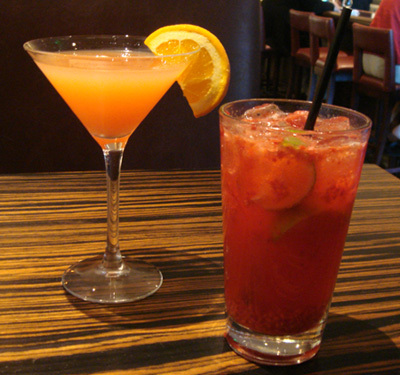 When I visited Met Bar and Grill, service was extremely slow, but food was good. And at this place, it’s not the kind of slow service that will make someone lose appetite (at least in my case). I had bacon wrapped something and it was satisfactory. Our waitress too continuously tried tempting us with dessert too; which annoyed us a bit.